from books, movies, videos, songs to authors, singers, articles, blogs. If you find it here, that means I highly recommend, give a thumbs-up, and release a stamp of approval on it! 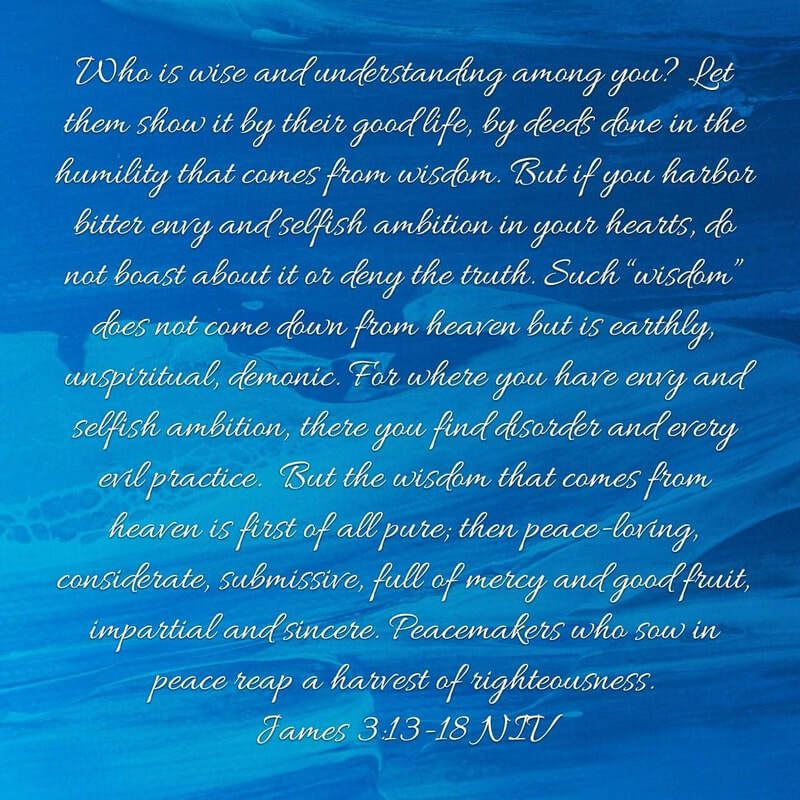 In the midst of self-doubt and in the wake of a leadership challenge, I stumbled upon a verse from the Book of James that speaks of wisdom, both worldly and godly. I knew right away why I had to come upon this. The Lord wanted me to do a heart-check. He wanted me to assess whether I am on the right track and with the right speed. Yet again, I am placed in a situation where the enemy is dragging me into a playground and making me second-guess my actions, decisions and motivations. Then again, it could also be God’s way of keeping my pride in check. I was in for a big discovery. Worldly wisdom sows and is rooted in envy and selfish ambition, the verse said. Was I seeking my own glory and not His? Worldly wisdom is arrogant, boasting and lies against the truth. Was my pride creeping up and making a scene in all of these issues? Are my actions giving lie to the truth I profess and want to impart to the sheep I was tasked to shepherd? Worldly wisdom is earthly, unspiritual and demonic, it goes on to say. Was I seeking my own will and not God’s, pushing to reign supreme and opposing God and His truth? The verse says it results to disorder, lack of unity and every evil thing. Was I pursuing my own cause causing division and conflict in the body, sowing seeds of malice and evil? At first it seems James was out on a witch-hunt and I honestly felt as if I was in an inquisition where I hope to come out unscathed. Except, I didn’t. And I am not at all surprised because Hebrews 4:12 says, “For the word of God is alive and active. Sharper than any double-edged sword, it penetrates even to dividing soul and spirit, joints and marrow; it judges the thoughts and attitudes of the heart.” Indeed, it judged my pride. Yet, even as I felt pinned on the ground and backed against the wall, God was gracious. He wanted me to see my own heart, to humble me for my own good. He wasn’t done speaking to me and so James went on. While God dealt with what was ugly in me, He also wanted me to check and see what He was making beautiful within. Something, the enemy told me that wasn’t there. Godly wisdom is pure and peaceable, James said. Am I pursuing peace in my relationships? Is there peace in my home, with my husband and children? Do I sow peace within the church and in ministry? Godly wisdom is considerate and submissive, he continues. Do I make allowances for the offense and fault of others or do I continuously seek, rant and zero in on what I perceive to be wrong with people and in situations? Am I willing to change my view when proven wrong? Am I quick to listen and slow to anger? Am I able to see the difference between issues that are worth giving blood over and those that aren’t? Godly wisdom is full of mercy and good fruit, he further says. Is my faith showing itself in practical good deeds? Do I have compassion for anyone suffering, whether those in sin and rebellion or those who are suffering because of God’s refining? Godly wisdom is impartial and sincere, he adds. Am I unwavering in my loyalty to Jesus? Am I a friend of the world or of God? Do I unswervingly hold the truth in love? Am I covered-up, putting on a game face? Am I projecting someone I am not? Am I transparent and genuine in my love and care for those whom I shepherd? Am I someone they can rely on for godly counsel? Such questions bombarded my thoughts. Just as soon as the enemy tried to sows seeds of doubt in my head, God rebuked it by affirming to me that He was working in my heart and has planted godly seeds as well. Nothing to boast about because He was quick to remind me that it was only by His grace that the seeds have grown. Through the many tests in the past and the many ordeals I had to face, God kept building me, kept raising me up and was relentless in making me a person He desired and designed me to be. Despite my failings, He was a Father who saw through my heart and was persistent that He was going to use me in spite of me. His grace was sufficient for me. When I was weak, He was strong in me. One thing I realized in this time of refining-- I must regularly do a pit stop, to pull over and to inspect if I have enough fuel and see if my tyres are still up for the race. I must turn to my pit crew, God-appointed people whom I trust to help me in this race : God - the Team Principal; Paul - my lollipop man and chief mechanic; my sisters Jo & Marj - my jack men; Jam and Cicc - my stabilisers; my dgroup leader, Ate Gnet & my very dear friend, Monette - my front wing men; my cousin, Mav - my refueling man; the ladies in my dgroup - my tyre carriers; my Quesci Bible Study ladies – my tyre changers; May Ann, my special Dgroup friend - my fire extinguisher man. At the end of the day, I am accountable to God but it helps to keep myself in check, to be accountable to those who I know seek the good for me. Accountable means, they are free to rebuke me in love, even when it is painful. They are ready to pull the punch when needed and I must not take it personally. It means that they love me enough to stay through when I am hard-hearted, they care enough to put a net lest I fall and be broken by God for my stubborn will and hard heart. Thank You Lord for reminding me about two kinds of wisdom—worldy and godly, one former, I must stay away from and the latter, one I must seek. Yesterday was one for the books. In the past birthdays I had and the days leading up to it, I would often find myself nostalgic, sentimental and almost always expectant. But this year, turning 41 came with peace. Two days before my birthday, my Mama said, "Lapit na birthday mo!" (Your birthday is fast approaching!) and I replied, "Ssssh, tayo lang nakakakaalm niyan, huwag mo ipagsabi!" (Hush, that's just between us!) It was my way of saying, there is nothing grand to look forward to. And honestly, I really thought my birthday wasn't until a week from that day. I guess I was that unmindful. I had no expectations and I realized how crucial expectations were to the state you would be in when your birthday comes. Because I had much expectations in the past, I would end up disappointed and embittered. And it was never because of the people I was surrounded with but because I was too consumed with myself, with what I wanted and what I felt I deserved. This year, like I said, was one for the books. One that is by far, the best. So what made yesterday one for the books? Peace, like I said. I found myself feeling the quietness and tasting the beauty in being still before God. It was a steady feeling that assured me that all is truly well with my soul. In all my birthdays, I had never truly felt such until yesterday. There is a security in my heart that I never quite expected to feel at this point in my life. Because 41 is such a random number, right? Who knew turning 41 could be this utterly beautiful and awesome? I guess I have reached that point in my life that I am content with what I have within my hands. The people who matters much to me were all present. I had spent the entire day with my husband, at home, cuddled watching, eating and talking. My Mama and my sister came bearing gifts and my in laws prepared a feast and bought a cake for me. I spent the entire day feeling loved. So much love that it was truly enough. Greetings came through social media but truth be told, I could not care less whether I received a hundred or none. Not because I do not appreciate those who took time out to greet me. I do and my heart is full! Yet I know that with or without these things, I am content and have joy. The kind that did not depend on anything temporal. The kind that operates on a steady trust in God and unfazed by any outside condition. But don't get me wrong. I do not live under the illusion that it will always be like this. I have a long journey up ahead and I am certain that the ride will be bumpy many times. The storms maybe daunting and my peace will be shaken. Many times over. But today and hopefully over the next few days and weeks, I will savor this peace, joy and stillness in my heart. How? By keeping in mind the only greeting that mattered to me on my birthday: God's message--He loves me. His love knows no bounds, age or time. He loved me at 15, 30, 40 and yes at 41. In my sinful state, in my redemption and sanctification up to the time I will meet Him face to face--He loves me. The kind of love that endured the Cross. No, he was not forced to do it for me. He freely choose to do so because He loved me. Now, what birthday message would beat this? It turns out, God’s perfect time actually happened sooner than I expected. Hubby received his retrenchment pay and told me I could finally get the chair I longed for. God was truly intentional when He purposely placed a family in our Thursday discipleship group who was a designer in a furniture-making business. Danica whom I fondly see as a crazy sister I never had, told me about what she does. Barely 15 minsutes in the conversation, she already got me interested with how she described the furniture-making process. As the conversation went, my husband and I got convinced that we have found the perfect company to make my special custom-made chair. During our chat, she mentioned about reading my page, even those thoughts I share randomly on my personal account, mostly about my walk with the Lord. Now those of you who know me, know what writing is to me. It’s my passion and I had been burdened to turn it into a ministry, thus the blog. It was music to my ears when she said she reads what I share. I often wondered whether people actually read it and get something from it and when she said she did, I was thankful. I always ask affirmations from the Lord whether I am actually living out my purpose and here she was, being an instrument by God to affirm me. What I didn’t know was, that wasn’t even half of what God had in store for me. Danica offered to give me a hefty discount because I inspired her with my rambling haha! Imagine that! I was dumb-founded and grateful with her offer. Of course I grabbed the offer before she changed her mind haha! So a few days after the conversation, we began discussing about the special chair I had envisioned. She took into account its purpose, my ideas and my preferences. I told her I wanted a chair which I imagined to be relaxing and something I can sit on during my quiet time in the morning. A specific request? I want purple. I wasn't too specific about the material as I knew it's best left in the hands of the expert. The next day, she sent me a 3D sketch of the chair along with the proposed materials. I found out that they use modern computer technology/program designed specifically for woodworkers and I was amazed at how detailed she was in describing the chair and this for me, clearly showed the passion the company has for each project. My curiosity compelled me to search online for the company and lo and behold, I actually saw a feature of their works for no less than The Kramers in The Real Living Page . This got me even more excited! Two week after, she informed me the chair was ready! Talk about swift service! I'm telling you, my pictures don't do justice to the awesomeness of the chair! It is such an elegant craft that I was compelled to name her—Amethyst! Who does that? Apparently an awe-strucked, crazy, purple-lovin' woman like me. And of course, as the momma of this beautiful chair, I just need to write about her and showcase her gorgeousness! By the way, I named my chair Amethyst as it is my birth-tone (I am February-born!) and it so happened that my favorite color is purple. Tee-hee! Their furniture-making process combines traditional techniques and modern technology. I appreciate that they were very careful to consider my preference and I was so enthralled at how my vision came to life with their 3D thingamajing. They make tweaks here and there and once finalized, she said that's when the real furniture-making process begins. They carefully select lumber based on hardness, color and wood grain. Then their craftsmen process, cut and shape it according to the requirement of each furniture. My Amethyst is made of mahogany in wood stain wenge so that means she is one strong and sturdy chair . They chose the upholstery and selected a lush fabric that went well with the very specific color I requested. The cutting according to Danica, is done by hand and carefully inspected then cut to form the shape of the furniture. Then stitching, quilting and sewing is done by another set of craftsmen showcasing their skills. I have been amiss in my quality time with God as the enemy made me busy with a particular ministry this December yet God had been faithful through it all. Why? I still cannot comprehend but what I know is He is a generous one who keeps giving lavishly to His children. When my husband said to let go of a financial loss this Christmas, he spoke to me with a certainty that God will replace it exceedingly beyond my imagination. I never should've doubted that yet I struggled thinking I could've bought and given more gifts had I gotten that money. Yet, my husband spoke with conviction as he told me to surrender it to God and I was compelled to submit albeit with still small voices of doubt. Action, as Paster Jess Lantin said, before emotion. Why am I sharing this? There is something I learned over this Christmas season -- to value the HEART of my children, the WISDOM of my husband and the JOY, HARMONY and UNITY of my family more than getting money, receiving gifts or giving ones more than we can afford. It is the first Christmas when we weren't able to give gifts to everyone on our list and that includes our kids. I could not help but think of that financial breakthrough I was expecting this Christmas. But guess what? God taught me an important lesson and affirmed the wisdom of listening to my husband. We all still managed to get our heart's desires through the generosity of people who love us/them dearly despite not being able give back equally. Case in point, that white and navy blue polo shirt my son wanted, the power bank and new charger he needed, the new basketball shoes (two pairs in fact!) my daughter has been dreaming about, the expensive Bible I have secretly been coveting and that family photo frame I have been thinking of getting, the organizer I truly needed for my ever-chaotic bag and the purple LC handbag I desired but can't afford, the TV plus my husband had been contemplating on buying a few weeks back as we have not had Cable TV for ages (cost-cutting measures). The point is God honored our desire to stick within our means as we built a margin on what we could afford and what we couldn't, what we needed vs what we wanted, giving within our means and with love and joy. God said I didn't need more money than I already have, no matter how little or big was in my pocket. His gift was not always monetary but what He gave was so much more than I imagined. The heart of my children are in place as they were gracious to accept what we could give them this season—not a new pair of kicks or set of clothes or the latest gadget but a home filled with love, joy and unity. My husband is plugged to God more than he has ever been and leads us with gained wisdom than I ever had. The peace and harmony my family enjoys, the imperfect yet genuine love my husband and I share, the friendships and accountabilities essential to my spiritual growth, the relationship I have with my Savior--it all begs me to ask the question: Why in the world would I still desire anything else this Christmas when clearly I have all God desires for me? If I don't have it, I don't need it. Over the last two years, I have been burdened to make amends with those I have wronged and was truly blessed that those I have sought forgiveness from, have been gracious to me. Relationships have been restored, transformed and fortified. I have also learned to let go of past hurts, to release anger and bitterness over those who have wronged me. He taught me to keep no record of wrong because He did exactly that. (It’s a struggle until now but by God’s grace I am able.) God worked in their hearts after He worked in mine and so reconciliations were made possible. Humility was something I had to learn the hard way. In retrospect, I realized that people who annoyed me were teaching me patience, those whom I hated were teaching me unconditional love and compassion, those who angered me were teaching me forgiveness. Those whom I feared were molding me to be courageous and bold. The proud people I come across are teaching me humility. Lately, God taught me another lessons. Anger is something we all feel and often find it hard to forgive. At some point in our life, we were angry at someone or at something. Some anger mellow down easily but some anger take root, grow into bitterness and so we refuse to forgive. It all depends on how deep the pain inflicted was and how remorseful the person who inflicted the pain is. But sometimes, no matter how shallow or deep the injury was, remorse or no remorse—people will just refuse to forgive. When we are burdened to reconcile and take that mighty step of humility to lower our guns, it is so easy to think that when and as soon as we do, the other party must forgive ASAP and ought to honor our humility. But what if they don’t? Does it mean that we should pursue still? Must we wait? Do we rebuke? Are we supposed to take offense? 1) True Forgiveness is a volitional decision that can only be possible for someone who has experienced real grace from God. I say this from experience. I could never forgive easily before, until I was humbled to realize I was a sinner, forgiven and redeemed. Receiving such grace from God, I was able to do that which I cannot before. Understanding the payment of Christ for my sins convicted me to forgive others no matter how deep the pain inflicted was and how unremorseful the person is. Until a person understand his sins, the payment for it and the One who paid, it will be difficult. 3) What I can do is pray for that person. Pray for good things for her, her salvation, her peace. People who cannot forgive need prayers and must be looked at through the eyes of love. They need Jesus. So, I turn her over to God to work on. Maybe He isn’t done with her just yet and until then I must be patient just as God was and has been patient with me.